AGUR has updated its diagnoses, and rekindled its prospective and business intelligence works with partners. 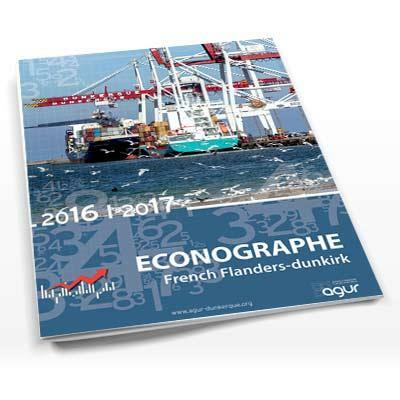 The second issue of Econographe contributes to this mission in the context of the revision of the territorial consistency master plan (so-called SCoT) of the French Flanders-Dunkirk area. AGUR, in partnership with Communauté urbaine de Dunkerque (the greater Dunkirk) and Communauté de communes de Hauts de Flandre (the upper Flanders Federation of municipalities), is publishing a new issue of this collection of indicators and analyses destined to economic and political stakeholders wishing to better understand the territory. Given the geographical position of Dunkirk, the economic approaches of this document are obviously on a large scale. And this is why they are as many contributions to the various projects of the Flanders â€“ Dunkirk territory. Even though it is not comprehensive, this Ã‰conographe provides again a complete economic picture, which is both thorough and very summarised. Its perspectives are as many references for the strategies engaged in the field of employment, forward-looking sectors, activity sites, investments… This is also an invitation to work jointly to the harmonious development of the French Flanders-Dunkirk area.